Like most traditional bike companies, Civia is a bike company that sells their bikes through a dealer network in the U.S. Most of their bikes are also traditional pedal bikes. 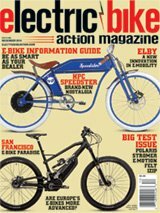 The Parkway is their introduction to the world of electric bikes, and they seem to have done a lot right for their initial entry. In short, the Parkway is stunning. Ours was a step-over frame, only available in a color called Clay Grey, but there is also available a step-through version in teal. The step-through has sizes to fit riders from 5 feet to 6 feet, and the step-over version has sizes for riders 5-foot-4 to 6-foot-4. The aluminum frame and fork have great curved lines and have very comfortable, upright geometry. There are bosses for a bottle cage and for a rear rack to hold up to 30 pounds of cargo. Total weight limits are 300 pounds for the rider. Weighing in at 43 pounds, the bike is lighter than most of the bikes we ride and has been put together in a way that it rides as well as it looks. We think the bike would look better if the cables were internally routed, but it’s not a glaringly bad style point. Aside from the motor, the rest of the drivetrain is pretty classic. Micro-Shifter shifters and a Shimano Sora derailleur run through the nine gears with ease, and those nine speeds proved to be capable for any hill or piece of flat ground we encountered. The bike doesn’t come with fenders, but accessory fenders can be attached, and this offers riders a chance to customize the look of the bike, as well as keeping themselves and their cargo clean if they ride through puddles. The chain guard will keep the chain on the sprocket and help keep your pants from getting dirty. Civia has outfitted this bike with a Bosch Active Line motor. The Active Line is a proven mid-drive motor, and though it has 40 N/m of torque compared to the Performance Line’s 75 N/m, it doesn’t have the same internal gearing, and therefore uses a regular sprocket that turns at the same speed as the crankarms. A 400 Wh Bosch Powerpack is ample for commuters and keeps the price lower. The 500 Wh battery is an option, but we think the 400 is perfect for this bike. The 400 Wh battery pack provides ample range. Civia claims up to 110 miles, though this would be in ideal conditions, likely with a 100-pound rider with a tailwind on flat ground. In the real world, we estimate most users would get 30–40 miles out of a charge, which is still not bad. The price of the bike is kept lower, thanks to the lower cost of the 400 Wh battery over the higher-capacity 500 Wh battery that Bosch has available. The controller on this bike is a Bosch Purion, a small display with the mode control buttons attached, so the unit sits by your left hand to make it easy to reach and toggle through Eco, Tour, Sport and Turbo modes. As a city bike, it’s nice to have the right tire for the job. The Kenda Kwick Roller Sport 26×2.0-inch tires were great on multiple surfaces. The Parkway is a good choice for commuters who don’t have to carry much to work, people who want an e-bike for exercise or light touring, and anyone who wants an e-bike with a more upright, relaxed riding position. Mechanical discs, especially with small rotors, are not always powerful enough. However, these proved to work just fine. We love just walking up to this bike because it’s just pretty to look at. Interesting little touches, like the laser-cut logo on the head tube and classic parts like an old-school-looking, mid-mounted kickstand all come together to create a classic, timeless package. Starting up the electric assist can be accomplished two ways. The traditional way is by pressing the power button on the Purion display mounted on the handlebars. The second, one that surprised us, was simply by pedaling the bike. The system automatically comes on when you pedal. It’s naturally in the off/no power-assist mode to start, but this method of kick-starting the bike was unique to this bike! A Bosch Active Line mid-drive provides the power and a very quiet ride. The handlebars have a really nice, gradual sweep, and the overall riding position is very comfortably upright. Grips are padded leatherette, and they do a good job of taking the shock out of bumps on the road. The Kenda Kwick Roller Sport tires are set up for fairly high pressure, which means minimal rolling resistance. The tires grip the road well, but when running 60 psi, you can expect to feel every gum wrapper you ride over, and you’ll certainly know the difference between a well-paved road and a bad one. Dropping down to 40 psi increased the rolling resistance a tiny bit, but made a big difference in how much shock transferred through the bike to the rider. This is one way to control how harsh the ride is if your roads are less than perfect. The traditionally styled saddle is as comfortable as it is good looking. We tested the tires over a variety of surfaces—from grippy to slick—and the bike always tracked perfectly, without slipping. The tires have Kenda’s K-Guard technology to help guard against punctures. The bike offers a spirited ride. It accelerates quickly up to the high teens, then there’s a noticeable power drop at 20 mph. But the way the motor is set up, it has less motor drag than a Performance Line that spins a smaller sprocket at 2.5 times the rate of the cranks. Hill-climbing was a breeze with this bike, especially if you changed the mode up to Turbo. Helping to keep cost down, the bike runs with mechanical-pull disc brakes, which are slightly easier to maintain and adjust than hydraulic brakes, but they provide less stopping power. Still, we’re happy to report that the brakes proved to be strong enough to control speed and stop easily. The Civia Parkway is a no-nonsense, classic-looking bike with a proven Bosch motor. We think it’s a good choice for people who want to use it to commute, run to the farmers’ market or just cruise to a friend’s house. It’s got good build quality, fine fit and finish, and a pretty good price.